You have probably heard the term “Inbound Marketing.” But do you know what is hidden behind that term? Inbound marketing is the practice of attracting new customers by sharing helpful and relevant content and adding value at every stage of their buyer journey. In contrast to outbound marketing, which has a lot of interruption, inbound marketing is more human, helpful and holistic. It creates content which addresses a problem, finds the solution and shows them the path that leads to that solution. By doing this, you attract qualified prospects and build loyalty to your business. The inbound methodology is the four-step process which includes attracting, converting, closing and delighting. The photo below shows how it works. You should attract strangers, convert them into leads, then turn them into your customers and develop them into promoters. Attracting strangers and turning them into visitors is the first step in the inbound methodology. How can you do that? Well, for doing this, you need to have content. You should share relevant and helpful content at the right time, in the right place and for the right audience. According to the Hubspot Academy which is the worldwide leader in inbound marketing, having the right content is not enough. Inbound marketing is the combination of content (what you are creating) and context (who you are creating it for). If you want the right people to come to your website, you should create content that will encourage them to go through the buyer’s journey. That’s why; it is so important to know your audience well. The important factors of content are purpose, format, and topic. The purpose of each content should be to educate people. When you educate them, you share value which is the key purpose of inbound. The content can be in various formats such as videos, images, polls, infographics, blogs, surveys, case studies, user-generated content, etc. Choose the one that fits your business the best. What refers to the topic, it is not as easy as it seems. You should pick up the ones that will undoubtedly attract the prospects and persuade them to visit your website. After attracting the visitors, the next step is to convert them into leads. Conversion is the moment when the visitor of your website takes the desired action. This desired action can be in various forms such as filling in the application, making a purchase or clicking a button. During the conversion stage, you offer your visitors something that will benefit them, help them solve their problems and find better solutions. In the case of inbound marketing, it is implemented through attractive and helpful content. Use call to actions(CTA) to encourage visitors to take the desired action. Also, have 24/7 chats to answer the visitors’ questions and keep in touch. If you manage to convert leads, they will give you their information which you can use to help them in their buyer’s journey. 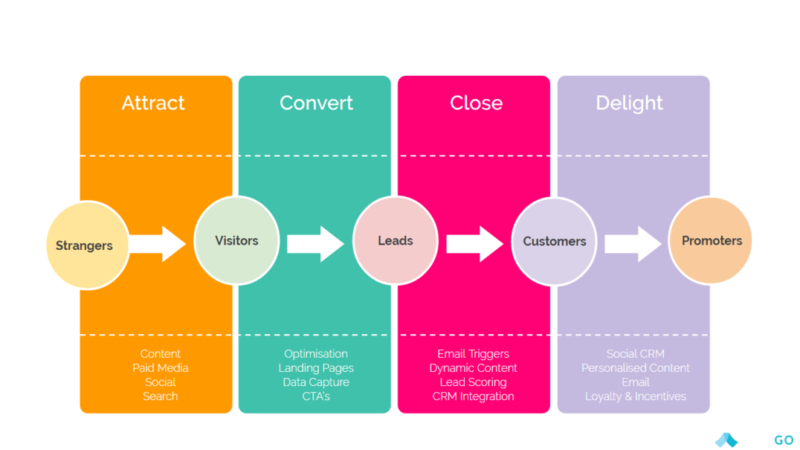 During the close stage of the inbound methodology, your leads are transformed into customers. It is a very critical phase as this is when your efforts are finally paid back. You begin earning revenue! However, it is not as easy as it seems. It takes quite a long time to close customers. During the close stage, sales and marketing teams must work together. The marketing team will continue providing relevant and helpful content while the sales department will make the purchase process easier. Many companies stop creating value for their customers as long as they have taken the desired action. If you belong to these companies, we have to disappoint you because you haven’t applied the inbound methodology properly. The forth step in the inbound methodology is as important as the proceeding ones. It is incredibly essential to continue to communicate with your customers by providing remarkable content which they will share with their friends and family. Continuing to create value for the delight customers will not only result in the strong word-of-mouth but will also awake their desire to work with you again.